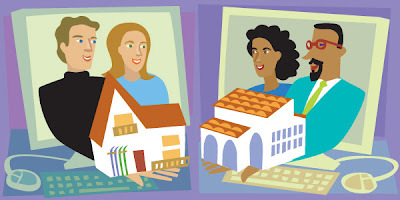 You may be familiar with the concept of house swapping. If you're not, I'll fill you in. It's when a person trades his/her home for another person's home. People often do it when they're having difficulty selling their home, and it's common that the traders are moving out of state. So, say if you took a job in Richmond, Virginia and had trouble selling your home in Charlotte, you'd look to see if there was a homeowner in Richmond who was looking to sell his home to move to Charlotte. If the property values were similar, you might make an even trade. If not, one party would throw in some cash to make up the difference. When I first heard of the concept, I thought it was strange. But in this struggling economy in which the housing market is hurting, it not only makes sense but it has become the only option for many people. On Charlotte's Craigslist, there's a housing swap section. You'll find posts that say: "Looking to trade Lake Worth, FL residence" or "Looking to relocate to Charlotte from Tampa." In addition to Craigslist, which some people probably use because it's free, there are dozens of websites devoted to house swapping (for a fee). But I'll tell you what blows my mind: the fact that people are swapping homes for vacations. In these temporary swaps, you would offer up your home to a person or family for a specified period of time to stay at their place. I could see someone wanting to stay at my house during race week, but they would need to live somewhere like Miami for me to be interested. This is something else that's being done more because of the economy. People looking to save money on vacations by not having to spend on hotels are swapping homes. I imagine they would also save on food since they would have full use of a kitchen as opposed to eating out during the entire trip. One of the popular websites to do a home exchange, as they're also called, for a vacation is Digsville.com. I don't think I could do this type of swap, though. There are too many crazies in this world. I wouldn't feel comfortable having strangers live in my house for a week. Who knows what they've done while you're gone? Some sicko might even install hidden cameras. Your comment about not feeling comfortable with the idea of having 'strangers' in your home is a common concern that most people new to the idea have about home exchange. Unlike in the film, 'The Holiday', home exchangers don't generally instantly agree to swap homes but rather, take lots of time to get to know each other through emails, and sometimes phone calls, asking as many questions as they want, before agreeing to go ahead with an exchange once both parties are comfortable with it. It helps to remember that potential exchange partners will at first be just as concerned about entrusting their home to you - after all, how do they know you aren't a crazy!? I hope you will visit my blog for more information about vacation home exchange. It's not a new concept - people have been arranging home swaps for at least 50 years, but you're right, it is becoming more popular in these difficult economic times for many. I get the idea...but not sure if I'm feeling it. I'm with you...I'm a little learly about letting people chill in my crib for a week.